For at least the past year, a pair of right fielders – the Dodgers’ Yasiel Puig and the Tigers’ Nicholas Castellanos – have been among the majors’ biggest potential trade chips. Neither player has gone anywhere to this point, but it now looks like only a matter of time before both Puig and Castellanos don new uniforms. During this week’s Winter Meetings, reports surfaced indicating the Dodgers are “actively” attempting to trade Puig and the Tigers are “determined” to ship out Castellanos. As of now, Puig and Castellanos haven’t been connected to the same teams in the rumor mill, but it stands to reason they’d have similar suitors. Los Angeles may even replace Puig with Castellanos, who would likely offer analogous on-field value and perhaps cause fewer behind-the-scenes headaches. 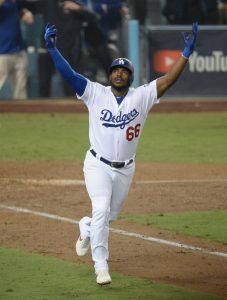 A native of Cuba, Puig signed with the Dodgers to great fanfare in 2012 and made a dazzling debut the next season, when he was as captivating as he was productive. The early version of Puig – the one who often inspired awe at the plate, in the field and on the bases – was not only a perfect fit for Hollywood, but he was also among the majors’ elite players. From 2013-14, Puig’s first two seasons, only Mike Trout, Miguel Cabrera, Andrew McCutchen and Paul Goldschmidt finished ahead of him in wRC+ (153). Meanwhile, just those four and 10 other position players outdid Puig in fWAR (9.5), despite the fact that he accrued fewer plate appearances than everyone near the top of the leaderboard. Had Puig continued to produce at anything resembling the blistering pace of his first two seasons, it’s possible the Dodgers may have worked to extend him by now. Instead, the 28-year-old’s numbers nosedived after his second season, and his relationship with the Dodgers has soured along the way. Thanks in part to those factors, Puig’s entering his last year of team control, and it seems like a strong possibility that he has taken his final at-bat with the championship-contending Dodgers. There haven’t been any reports of problems between Castellanos and the Tigers, on the other hand. Nevertheless, as a team in a rebuild, Detroit’s positioned to bid goodbye to Castellanos – whom it chose in the first round of the 2010 draft. Like Puig, the soon-to-be 27-year-old Castellanos is entering his final season of control, and the two players are projected to earn matching $11.3MM salaries in 2019. The similarities continue in the form of their respective outputs dating back to 2016, Castellanos’ breakout season. Since Castellanos finally began living up to the billing he had as a prospect, he has accumulated 1,790 PAs and 7.0 fWAR on the strength of a .285/.336/.495 batting line – good for a healthy 121 wRC+. During the same period, Puig totaled far fewer PAs (1,382) but still managed 5.8 fWAR, thanks largely to a .264/.334/.470 slash and a 115 wRC+. Puig also swiped 35 bases, easily trumping Castellanos’ seven, and destroyed his fellow trade candidate in the field. From 2016-18, only nine outfielders piled up more Defensive Runs Saved than Puig’s 29. 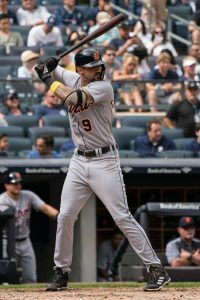 Meanwhile, Castellanos has struggled to find a position – he was a butcher at third base from 2016-17 and also fared poorly in the outfield last season. Consequently, Castellanos’ future may be at first base or designated hitter. Aside from their dissimilarities in the field and on the bases, the two right-handed hitters have also provided their offensive production in different ways. Castellanos tortured left-handers from 2017-18 – a 308-PA sample in which he slashed .338/.386/.585 (159 wRC+) – whereas Puig was borderline unplayable versus southpaws in the same span. Although Puig was a formidable presence against lefties earlier in his career, they held him to a feeble .197/.292/.320 line and a horrid 66 wRC+ over the previous two seasons and 259 PAs. As a result, the Dodgers limited his playing time when a righty wasn’t on the hill last season, reportedly leading to discontentment from Puig and an open-minded attitude toward a trade. Both Puig and Castellanos may well have new homes come 2019, potentially joining the top free-agent corner outfielders – Bryce Harper, Michael Brantley and McCutchen – in that regard. McCutchen’s already off the board, and for teams that aren’t in position to ink Harper to a record contract or hand Brantley a lucrative multiyear payday, Puig and Castellanos could represent appealing alternatives. The question is: Which player would you rather have? I really enjoy watching Puig as a fan. However, if I were a GM, I’d take Castellanos because, as the article notes, the production would be similar – and Castellanos would be much better for my blood pressure. Castellanos is the more consistent offensive player, but Puig is a whole lot better defensively. That’s a good point. I’d still go with Castellanos, but Puig is terrific in the field. Puig be on my list….defense and better obp. he needs a team that can play him more 425 abs for his true value. If you can’t hit lefties or even get on base you’re not going to see the ABs. Puig started as an enthusiastic productive player who loved the game and then the Dodgers Mentally Castrated him by wanting him to play with less enthusiasm. Shameful! I half heartedly agree. All players need to play with a great deal of enthusiasm, but also in a controlled way. Castellanos belongs in the Al as a DH. He may be worst fielding OF in MLB. So, good luck to the Dodgers. Go get him to play RF regularly. Offensive production would be similar but Puig is probably a top 5 defensive RF. If i’m an NL team I would take Puig. If i’m an AL team with a need at DH I would take Castellanos. I agree. Or even if it’s an NL park with a smaller outfield might help Castellanos’ defense. I also think Castellano may become better offensively than Puig. His numbers have basically trended up every year, plus he’s even two years younger than Puig. Castellanos crushes LH pitching whereas LH pitching has crushed Puig in last couple of seasons. Puig would be a perennial All Star if he hit LH pitching as well as Castellanos. Castellanos is the worst outfielder in the majors by a large margin. He is destin to be a DH or a bat off the bench. I wonder if he could become an average OF. His Fielding percentage was league average last year in only his second full season playing the position. Give me Puig, despite his antics. What article would use “butcher”? Nah Tigers fans in these forums. I see a certain Mets fan is feeling confident! Overwhelming Tiger fan sentiment on these forums is his defense is atrocious. hope you get good prospects for him! Geez! You did not notice one of the main differences between the two? Maybe because Puig isn’t a perennial GG candidate. Go Yankees. Puig is definitely one of the best defensive right fielders in baseball. There just happens to be another guy named Heyward who’s won almost all of the NL RF Gold Gloves since Puig came into the league. Xabial…. reading an article? No… it can’t be!? Anyone who follows baseball knows Castellanos is a butcher in the field. Doesn’t matter if Xabial chose to use the same word. Castellanos would have hit 35 homers in almost any other park so you deal with the Defense in a smaller park & take the bat. He would make Wrigley look very small and he can be hidden at 1b or RF in a small park. Puig is just not worth it on any level. I’d rather have Puig, at least he can play D.
Puig. He’s able to play the field. If i were the GM or POBO of a team with a middling chance at .500 and in need of a 1st baseman, i’d go for Castellanos. The offense fits the position and his previous time at 3rd could mean a switch to 1st is doable. The Pirates seem like a good fit. He’d upgrade the offense there and can’t be any worse than Bell defensively. The pirates arent going to spend prospects on an 11 million dollar first baseman, when bell is fine as it is. I disagree on your Bell assessment, but that’s okay. I dont think bell is great, but hes probably their best infielder right now, and I would guess the organization sees it that way as well. so why spend prospects and 11 million dollars upgrading there, when the middle infield and right field is a gaping hole right now? Because Castellanos is still fairly young at 27 and he’d add offense to a team that is lacking in that area. Especially with Polanco being out for some period to start the season. I get the need for fixing the infield. But there are plenty of 2nd base options in FA that will come cheap enough. Even 3rd can be fixed through that avenue, on the short term. Bell has 4 years of control left. I’d imagine a swap f the two could be done with minimal adding on. If I were any gm that wasn’t the Dodgers- I’d take Castellanos at this time. If Harper signs anywhere but the Dodgers I’d be more open to taking Puig. Don’t want to part the Red sea for the Dodgers to dominate for the next half decade. Obviously I’m not a gm, just a bitter Padre fan. This is no contest: Castellanos is pretty much a DH-only, Puig is at minimum a decent OF. NC had a .361 BABIP last year (his career mark is .333), so don’t expect a repeat of his 2018 offense either. Puig’s 2018 BABIP was .286, down from his career mark of .318, so expect better from him in 2019. I’ve read a lot of comments about Puig and no one really understands the dynamic he brings. First off, take WAR. If you looked at plate appearances–he would AVERAGE 4.5 WAR PER YEAR! Close to All Star every year. And then you take his attitude on the field. This guy wants to win! He puts everything out there. Look at him in the dugout when a teammate gets a big hit (or makes an out). And then look at community. Stopping by a bunch of kids playing ball on the streets to say hi and sign autographs. Hospital visits, etc. Let Puig be Puig. Yep he overthrows cutoff men (once in a blue moon); but others do too. But they are not noticed. Because they are not Puig. Yep he has run into an out on the bases–but ditto–. I am a big dodger fan, but I have always tried to use objectivity when judging player performance. In 2018 Puig had 444 PA with a WAR of 1.8 while Kiké had a 2.9 WAR in 462 PA and Joc Pederson’s WAR was 2.7 in 443 PA. IF you extrapolate Puig’s 2018 WAR based upon 600 PA his WAR would be 2.4. BUT, that would mean that he would have to play against all pitching including LH’ers that would reduce the expected WAR. Puig is a good player, but by no means an All Star. Castellanos needs to burn his glove as he makes JD Martinez ( a pretty good offense only comparative player) look like a Gold Glover in the outfield. He was terrible at 3rd which I believe is where he was played previously. His offense will attract attention. Yeah & having 8 OF is such a great idea especially with 5 pitchers over 32 say hello to 100 games won & another losing playoff venture. Cashman doesn’t get it! Stanton deal killing him daily! I think we need to get rid of all the pitchers, catchers, and infielders, and play a 25 man roster of outfielders. We could revolutionize the sport! Harper at first, Castellanos at third, Puig at catcher, Outfield of Judge/Stanton/Ellsbury we play Hicks and second and leave short stop open. Pitchers? Who needs them! We have Harper and Judge so we’re winning the WS. Go Yankees. you have 1 title in 18 years, sit down, you sound delusional. And you have 0 titles in 18 years, your team is cheap and you’re a bitter jealous Yankee hater. Go back to your sewage swamp of a “stadium”. If you want to go that route, several teams haven’t even got a title in the last 18 years but let’s look at it this way. In the last 18 years, the redsox and Giants have 7 of the titles. The Redbirds have 2. That means that 9 teams have a single title. In that group, the Cubs, Astros, Marlins, Angels, Royals and White Sox all have titles. These teams have been historically bad. So you shouldn’t brag about another team having only won a single title in 18 years when so many bad teams have more success than the dodgers. BTW, I’m a Braves fan so I know a little something about great teams that can’t win it all, but even we have a title since you guys. No one kisses and licks a bat like Puig! Watching that over an entire season would drive me nuts. That alone is a reason to reject him. You wouldn’t have liked Mark Fidrych then. I wouldn’t want either one. I’d rather have Markakis: good OBP, decent defense, and a great clubhouse guy. You say that, but I think it’s more likely the Braves bring Nick back than they trade for either of these outfielders. You didn’t say “more likely” in your post though, you said “I’d rather have” – that’s confusing. I do get what you’re saying though and I hate it but you’re right, the Braves really would get Markakis over Puig just for “intangibles/whiteness”. Chipper was great but he melted the Braves identity into this specific kind of guy. Puig is…not that guy. Markakis…totally is that guy. Yep. Bring back Markakis. Don’t need Puig to be a cancer in the clubhouse and bad influence for Acuna/Albies/Camargo. The whole “Puig is a headache” narrative is getting really old. He struggled with immaturity for his first few years (wouldn’t you after coming from poverty to a millionaire lifestyle?) but the last couple seasons he has made great progress. He’s grown up a lot and has become a fan favorite as well as a sparkplug for his team. Finally a decent take on Puig. Thank you. Why do all ballplayers have to be stoic and ice-veined types anyway? Who decided that was to be the norm? The Yankees, with their stupid identity-policing policies about hairstyle? Who??? Furthermore, why do some fans really hate flashy guys with flair? Hitting a round ball with a round bat 400 feet going 100 mph, is HARD. You should be allowed to celebrate! I watched that bat flip guy from Korea video that was posted here yesterday 10 times in a row and it never got old. Bat flips should be the norm, an added piece of flair to the game. Think of anyone you know who hates baseball: what’s the #1 reason they ALWAYS say why they don’t like it? “Because its boring.” Bat flips are awesome, they need to be added and EVERY hitter should be celebrating in their own way. We should be giving awards to best bat flips, not policing them. I guess some people like flashy and some don’t. Some people like flashy bat flipping players and still love the game and there’s people who don’t like that type of behavior and still love the game. I think it’s fine to love the flashy bat flippers and conversely it’s fine to hate them. It’s a game of entertainment, people choose different ways to enjoy it. Power to both sides. Just keep watching and supporting baseball so it continues to thrive no matter how you feel about players. I mean that’s what we have now, but I’d like to see some progression towards accepting it and making it like a TD celebration or slam dunk contest aspect. I mean they look cool. This is true. People hate it because people think it’s pimping it and people hate Puig because he celebrates too early sometimes, but also: these same people are totally fine with Kirk Gibson making all those gestures in ’88. It’s more like -certain- people aren’t allowed to celebrate anything than anything else. I mean, players ARE allowed to celebrate defensive plays anyway they want, don’t you find that hypocritical? We should just accept bat flips and make them normal and appreciate them, they really could become a thing of their own. The Yankees should get them both and platoon them. I mean the Yankees should get both, sign Machado and Harper. Trade for Kluber, Bauer, Realmuoto and then collect their rings. Yankees should just buy every team and then cancel the season and collect rings. Yankees should yankee and then yankee, Yankee, yankees. Yankees! They should change the name of this site to just yankeetraderumors.com. Or actually MLB should change to Yankee League Baseball! Done. Puig is an excellent outfielder and absolutely destroys right handed pitching. The problem is he can’t hit lefty’s and brings a dynamic to the clubhouse that many teams would like to avoid. He hit lefties fine until 2017 then he ran into a .198 BABIP in 2017 and a .243 BABIP in 2018 vs them. When that’s up around .290 we get 2014 Puig. I actually hope the Dodgers don’t move him and get Harper because Puig and Harper in the same OF is going to make Dodger games must-see tv. You are not going to get a .290 BABIP when you hit pop ups and weak ground balls. It’s a mechanics thing for sure. 100% Puig. You can tell he still has the athleticism to put it all together & make a major breakout offensively. Plus that right arm is supernatural. Puig really has not been a problem in the clubhouse for last couple years. I enjoy watching him. My biggest compliant is he tries to do too much. Still over shoots the cutoff man occasionally and does some bone head things on the bases. But I think he’s fun and entertaining. I wish he could hit lefties and we wouldn’t be talking about this. And if he really said he distrusts management, then he needs to go. Management is not hitting against lefties. He is. Hit them, you play everyday. How about option c….none of the above. Puig is a joke. I’d take pretty much any player over him. The problem Puig has had is that the Dodgers organization has tried to tame him. He needs to play in a place that gives him some space with his “wildness”. He is a HUGE fan favorite in LA and some people will be pissed, but in a place like Miami or Cleveland (now that it seems like they are going to rebuild) he could be a star AND put up decent numbers. I am an LA fan and I wish the best to him. If it’s in LA, even better. Puig and Mattingly are oil and water. Cleveland is not rebuilding. They are reorganizing their payroll to fix needs in the outfield. This has only been mentioned many times. I think Puig would be a very good player for Braves, but who would Braves give up for Puig? Keep Puig as far away from the Braves as possible. Anthopolous knows better, given he came from the Dodgers’ organization. “Anthopolous knows better” – he’s a guy who got Toronto to the postseason after 7 years aka too long a rebuild. I’ll never understand the love for that guy, He has been a GM for 9 seasons and has 2 postseason appearances in that time. 2 out of 7 is 29%. Beane, who routinely gets roasted by trolls has been running Oakland for 21 years and has 9 postseason appearances. That’s 43%. Maybe respect Beane more if you think AA is actually good at his job. Are you talking to yourself? No one expressed love for him. I am saying he came from the Dodgers organization so he knows first hand how much of a cancer Puig is, therefore he’s not going to acquire him. You can go back to talking to yourself now. I’m quoting you so no, I’m not talking to myself. “I’ll never understand the love for that guy, He has been a GM for 9 seasons and has 2 postseason appearances in that time. 2 out of 7 is 29%. No one said they loved AA and no one was comparing him to Beane. Your post completely misrepresented my point. Nice try though. Anyone who wants Puig in a Braves uniform either hates the Braves or doesn’t have a clue. Yeah yeah, they said the same thing about Gary Sheffield and he worked out great. The Braves haven’t exactly had a bunch of choir boys. CJ wasn’t a great dude. Furcal had his issues. Escobar, Rocker, Sheffield were all “questionable” guys but we won with them. Puig’s teammates like him, most of the local press like him, not sure what he’s done to drum up so much hate. how desperate do you have to be to cling to such a horrible stance that you’re going back two decades? for your own good, you need to stop. Really? How about recent history then. The Dodgers have been NL champs the last 2 years with Puig and his teammates all love him. You’ve given zero reason to dislike him. His laziness has prevented him from living up to the potential he showed when he first arrived in the bigs. If he’s such a favorite in LA, then they can keep him. Laziness? Lol, you can stop now. You could’ve said mental blunders, you could’ve said he loses focus, you could’ve even said he’s a hot head, but you can not say a physical specimen like Puig is lazy. Dude wants to play everyday, that’s where most of his frustration with the Dodgers comes from. And Puig would ruin Acuna? How did he ruin Seager, Bellinger, Buehler, or any young Dodgers player? Sounds like you’ve got some bad information or some deep prejudices. Either way, you sound like a tool bag bashing a guy with no specifics. “He’s a cancer” “he’s lazy” lol, go to bed junior. I don’t care what you think or say because it won’t change the fact that I want Puig as far away from the Braves as possible. “… (Castellanos) also fared poorly in the outfield last season…” is a huge understatement. Castellanos was dead last (-20.7) Fangraphs defensive WAR rankings in 2018. Puig did not have a good defensive year in 2018 compared to his outstanding 2017 performance. If I am the GM of an AL team I take Castellanos and move him to 1b and/or DH, but if I am an NL team I only take him if I am convinced he can be an average defensive first baseman; Puig would be the safer choice. Puig belongs in the Japan leagues. YOU BELONG IN THE JAPAN LEAGUES! I believe the Mets have been linked to both players recently. The indication was that the Tigers were asking for a lot for Castellanos, while the Dodgers were very eager to move Puig. That is a strong point in Puig’s favor, since I am not happy trading for a 1 yr rental. Irrespective of the cost in players/prospects, I would still choose Puig. I think that a change in location could result in him reverting to his original self. Moreover, while their offensive output is similar, Puig far outshines Castellanos in the field and on the base paths, tools the Mets need more of. Puig has an absolute cannon of an arm and I would love to see him in RF at Citi in 2019. …And this little Puigy went wee-wee-wee all the way out of LA. I spite of what this article says, Nicholas Castellanos is not a “butcher” at 3B. He is, by no means, a good 3B primarily because he has very low range. The Tigers never had a permanent target potion for him in the minors so, he’s had to develop at MLB level. His OF defense may improve (or not). Offensively, he is improving and the last two seasons he has 300 + TB. Still, he can be used at multiple positions if a team has a strong need. Yasiel Puig is digressing.offensively, defensively and off the field. Off the field too, huh? Amazing insight from a message board posting. Puig is the better player, when you factor in his defense. The problem is you get a superstar attitude with solid player production. and what’s wrong with that? He thinks he’s good = he is good? Stats dictate what kind of player he is, so unless he’s terrible, him thinking doing something great, is worth celebrating over, is fine. Bill Plaschke is the worst sportswriter of our generation and his poison is all over the public’s perceived attitude of Puig. With total offensive profiles so close, I’ll take the better defender and base runner every day of the week. check their stats in last 2 seasons against LH pitching. other than he has not consistently hit well against LH pitching. I want Puig so badly but there’s no chance dodgers trade him to the Rockies. Puig should be banned from the game due to his antics and unprofesional attitude. Blatant disrespect towards OUR game, not his. Next you’ll tell me you hate social justice warriors and political correctness. Any more contradictions today? Can we just be social libertarians on all issues? I don’t care what Puig does unless it hurts me financially of which it doesn’t. He doesn’t go up to me and take my money and then burn it by flipping his bat. I don’t know what being a librarian has to do with his arrogance. He needs to grow up and stop acting ganster wannabe. I read some of this criticism and it’s a joke. You don’t have to like Puig, whatever it’s a personal preference, but not acknowledging he’s grown up is completely disingenuous. Especially with all the criticism when it comes to guys like Machado and Harper and hustle concerns/dirty play. 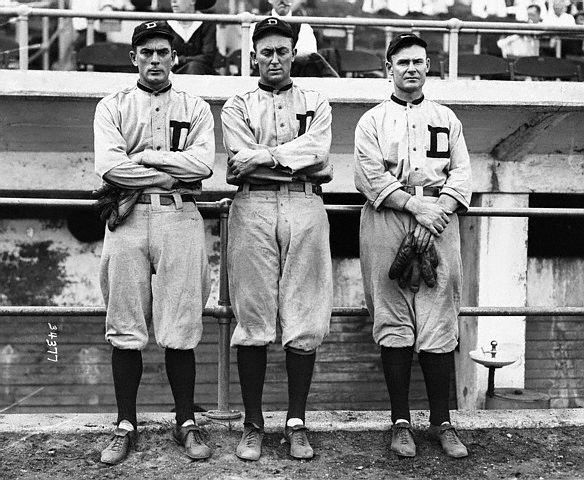 The ire of Dodgers brass early in his career revolved around his work ethic. Guess what he’s grown up. He plays the game without regard for his body. He’s not a superstar, he makes some boneheaded mistakes here and there, but stop with this he’s a cancer or clubhouse malcontent. If he could consistently hit lefties there’d be no talk of trade. The construction of this team, makes it so that it’s a greater need especially when the Dodgers continue to spit out lefties and have them in droves even in the upper minors. Puig is a very very good player who may never live up to his full talent, but the floor is pretty darn good. He’s a plus defender, a spark plug, and has been terrific vs RHP. Offensively his approach has seen tremendous strides. Some have pretty backwards assessments of Puig and it’s laughable. I agree. My dream scenario is signing Bryce to play LF and keep Yasi manning right. I’d even be okay giving him Puig more reps against LHPs if he works his tail off and shows strides. Personally I wouldn’t. Management has basically drawn the plan and followed it to a tee. I’ve always felt as though the right guy for this team/way they are constructed would be Arenado. He checks so many boxes the most pressing would be the need for a long term RH bat, and he’s clearly the best defensive 3b in the NL. Harper is young and Uber talented, but if the Dodgers are going to spend big I’d rather they did it on Arenado. To me there is far and away more value in a guy like Arenado playing 3rd than Harper in LF. Let me start by saying I think every team in baseball is better by having one of these 2 people. Most of the emotion seems to be a love/hate with Puigs demeanor and actions. The second is the love hate between Castellanos’ hitting vs fielding. As it currently stands, I think most people agree that NC is a better hitter and Puig is the better defender. My defense for Puig: It may not always be easy with such an intense person, but he clearly loves the game and wants to win. He has been and shown periods of time where he was great. Things like him struggling against lefties will happen, it is a chess match and he needs to remain a professional as he works through rough patches. I think he has many strong offensive years ahead. I told you which one was which but I think you get the point. The eye test gets most people to agree that Puig is the better defender, but the numbers are better for NC. Watching both in RF, you can see that Puig has a stronger arm and better range yet Puig and NC tied for 2nd in the league behind Haniger in OF assists. NC also had 5 less errors running around more innings in a bigger stadium. People over exaggerate NCs defense the same way others exaggerate Puigs attitude. NC has his first full year in RF and will only get better. Puig will also continue to learn and grow. Lots to like about both of these players. This is where traditional numbers get you in trouble and why they have their limits. Puig naturally will have less opportunity at assists, because guys simply have stopped running on him. The other issue is errors are subjective in general. They are absolutely the worst measure for OFs. An OF could botch a route/misplay a routine fly ball and as long as they don’t touch it it’s not an error. Errors don’t really tell you much beyond a kicked ball or a ball that clanks. Generally more range and ability to get to baseballs will lead to more errors. Advance metrics completely state a different story. I.E. Puig has a 6 DRS while Castellanos had a -16. If you were to go with Outs Above Average the gap is still as wide as DRS. Castellanos is a better hitter and belongs on 1st or DH. Respectfully they are not in the same ballpark defensively. This is where traditional numbers get you in trouble and they they have there extreme limits. Puig naturally will have less opportunity at assists, because guys simply have stopped running on him. The other issue is errors are subjective In general. They are absolutely the worst measure for OFs. An OF could botch a route/misplay a routine fly ball, and not be credited for an E as long as they don’t make contact with a baseball. Errors for OFs don’t tell you much beyond a kicked ball or a ball that clanks which makes the whole concept hollow. Generally more range and ability to get to baseballs will lead to more errors. Advance metrics show a completely different story. Puig had a 6 DRS in 18 while Castellanos had a -16. If you were to go to Outs Above Average the same sentiment is there. Castellanos is a better hitter and is probably better suited for 1B/DH. A team might be able to live with him in LF, in a small ballpark, if you felt it was an easier read for him/bat played more promise. There’s really no over exaggeration of his defensive limitations. Respectfully they are not in the same class defensively. I appreciate the logic in your response. You can get in trouble with traditional numbers, and my thought is people equally get in trouble with advanced metrics. For me, making the plays you are supposed to make and nothing more (lack of range) should be a 0. Threw out the people you should have, and maybe a few extra and caught the balls you should. If you mess up regular plays, then you should go into the negative. If you get what you should get and then some, you should be in the positive. I feel that my viewpoint is in between advanced metrics and traditional. You have to use a blended approach. In NCs case, he makes the plays he should and can continue to improve his reading on the ball and range as years go on. If he were in his 30’s there is a different case to be made, but at 1 year in RF and 26 Y/O, there is only upside in the field. There is no reason a guy like Bryce Harper should be -26 DRS. My views are fairly aligned with this article. I like the way they break down how it gets to the -26 DRS and the flaws in that approach. I also look at the inconsistencies in how multiple sources view and calculate war, drs and other metrics so show that there are still many elements with how humans weigh certain things. There are also big variances year to year that lose my trust in the metrics. Puig’s arm had a 5 rating in 2014. He was a -1.8 in 2018. Why, because he airmailed one or two balls over the cutoff man? I just feel the metrics are hypersensitive to certain pieces of data that sway the numbers dramatically. Is Jacoby Jones truly the best outfielder in the league? That’s what these metrics say. He has a better DRS rating than mookie betts even through Betts has better arm and better range according to these same ratings. They both made only 1 error all year, so how is Jones better? You’re forgetting one thing Castellanos, as much as I love him, has horrible range. Regardless the number of putouts he just doesn’t get to a few too many. Puig’s value is diminished by only being controllable for this year. There is no way he’s not testing free agency. One thing you could do with Castallanos is put him back at 3rd. No super stud there but certainly better than OF. If you think NC is a bad RF, you shoulda watched him play 3B for a few years on the Tigers. But at least he looked good with his top 4 jersey buttons undone, no under shirt and flashy gold chains.